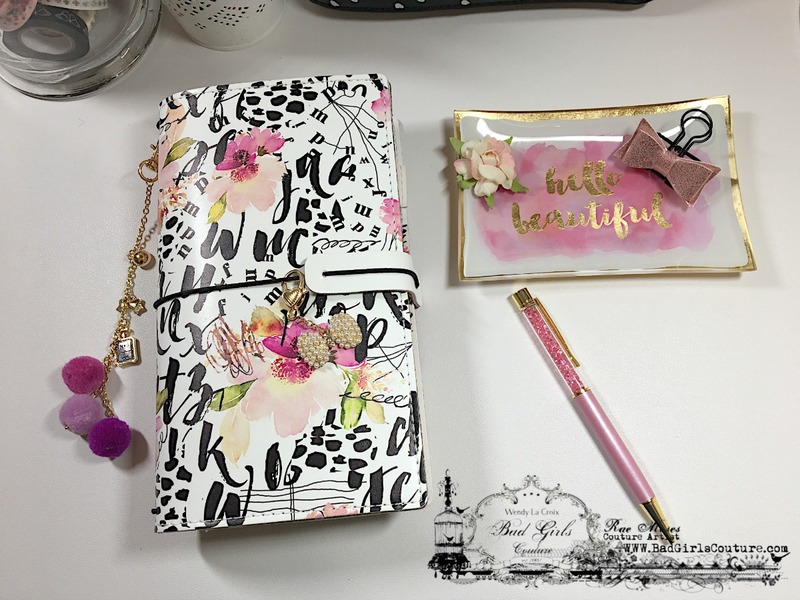 I'm excited to share that I have entered the Planner World. 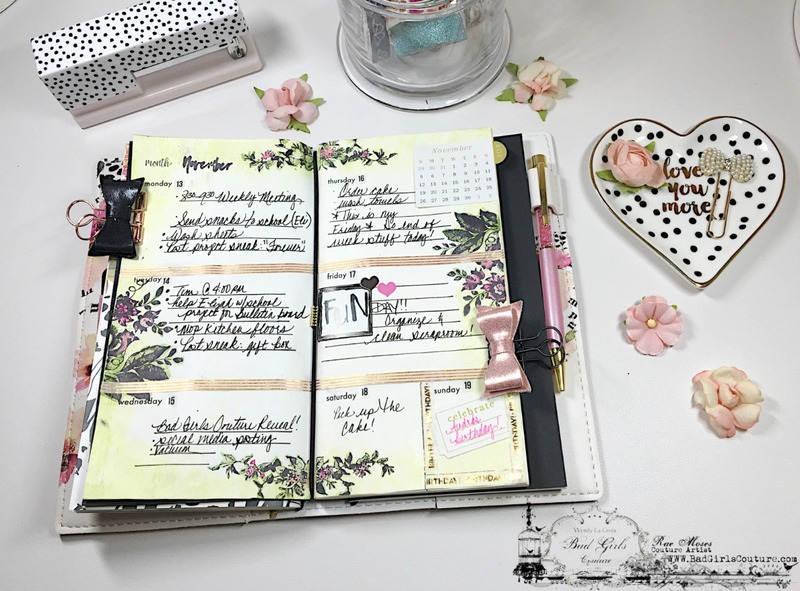 As an avid list maker and scheduler, I've been wanting to delve into the planner craze that seems to be happening. I've purchased TWO planners (both Prima) and many planner supplies. They've been sitting in a box, and I was thinking it would be a good resolution for the new year to bust these out to help me stay organized in a fun, creative way. 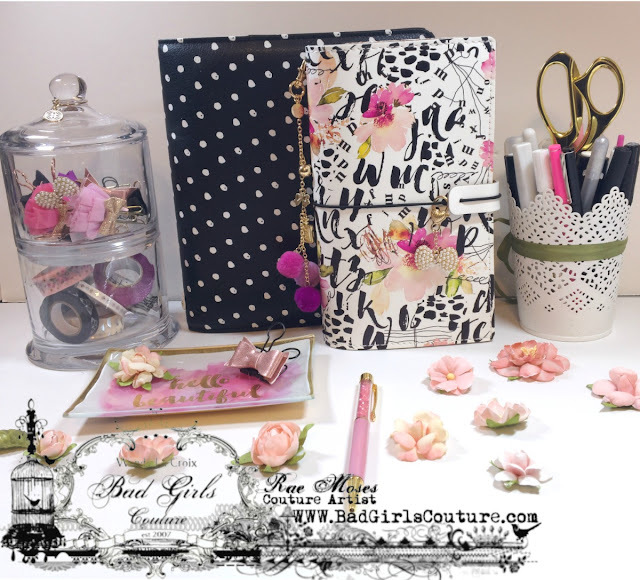 And, then... Bad Girls Couture was offering planner kits, so it was a no brainer that I should get an early start on this adventure. Take a look at the kits available IN THE SHOPPES. 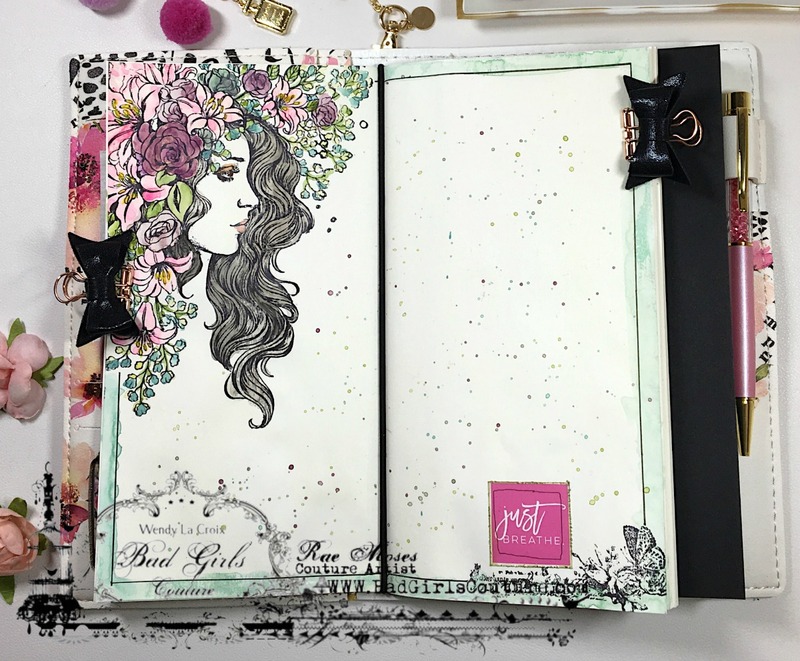 Design team coordinator, Nicole Martel, designed with this "Girl Boss" kit- take a look what she did HERE. 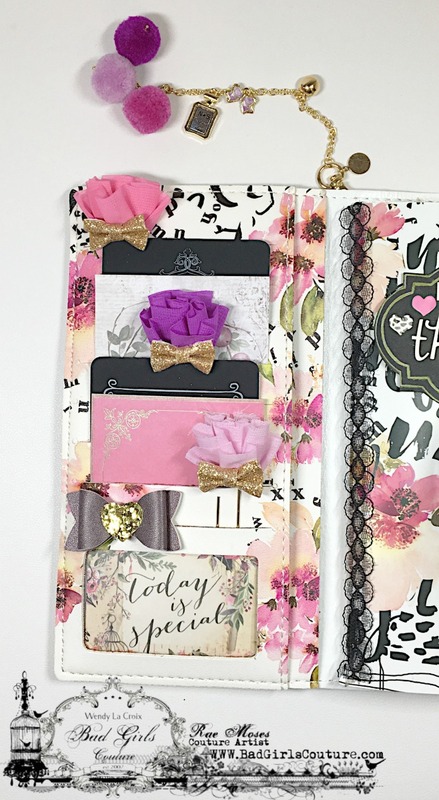 I just LOVE what she did with this planner! I LOVE this Metro Confidential kit- it's so girls and pink- not my typical color, but I love how classy and chic it is! The first one is my monthly insert- I used the washi tape from the kit to decorate the cover, along with a black paper die cut so I could add a title. I used the script stamp from the kit with some white chalk ink on the cover. I also used some watercolors for some pink and purple splatters. I used a few things from my stash- doily and ephemera pieces. The heart stickers and small clock sticker are also in the kit. 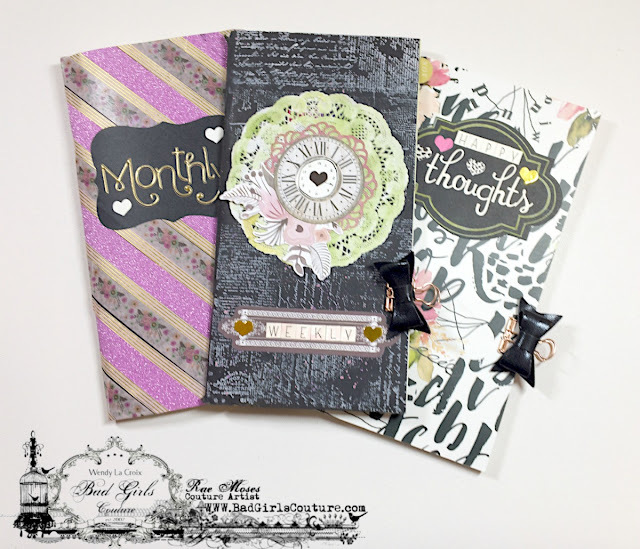 The journal insert that matches the cover design is blank, but I'm using that one for journaling "happy thoughts", which I added a black card stock die cut to with some alphas from my stash, and some cute heart stickers from the kit. To start out designing this monthly spread, I dry brushed on some clear gesso because I wanted to use some watercolors for the border. Once dry, I took the prima scroll stencil that came in the November Joie de Vivre scrapbook kit and placed it on the border of the pages and added some fall colored water colors- it doesn't exactly look like the stencil, but it gives a great mottled look of fall colors. Next, I added the pink and gold washi tape to frame all of the boxes for the days of the month. I pulled out the gold square stickers from the kit that I wanted to use, but with the washi tape borders made the boxes too small for the stickers so I put them into a circle punch to cut out to make smaller and add some different details to the spread. 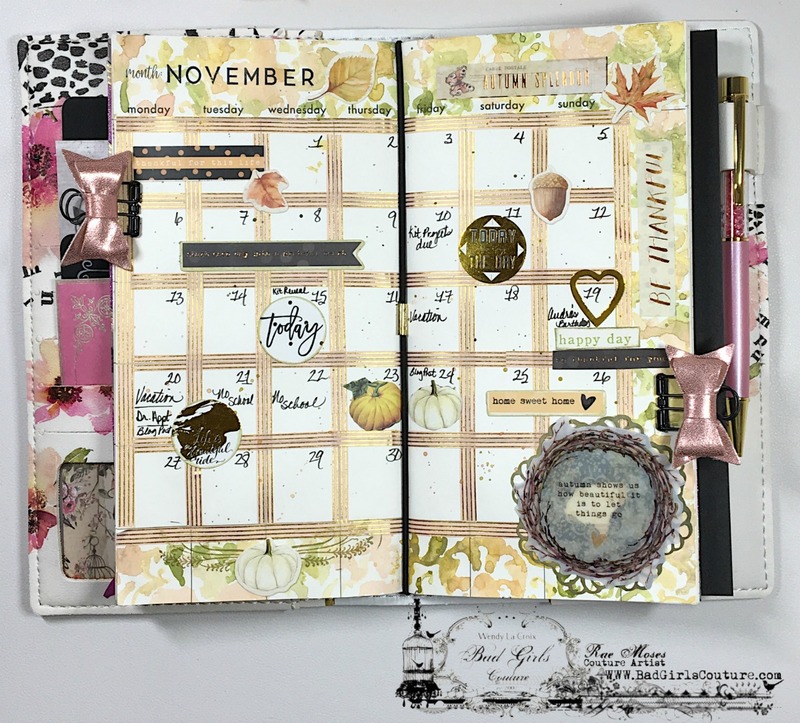 Because it's November, I dug some fall scrapbooking stuff from my stash to complete the look. I started out this spread the same as the monthly- clear gesso to use watercolors. I started off with a diluted green color for the entire page, giving the spread a darker green vignette, I added some stamping with some basic floral images. I went back in with the watercolors with green and bright pink to accent the leaves and flowers. I added the pink and gold washi tape to separate the days of the week, and added one of the fun tickets that says "Celebrate" to Sunday. 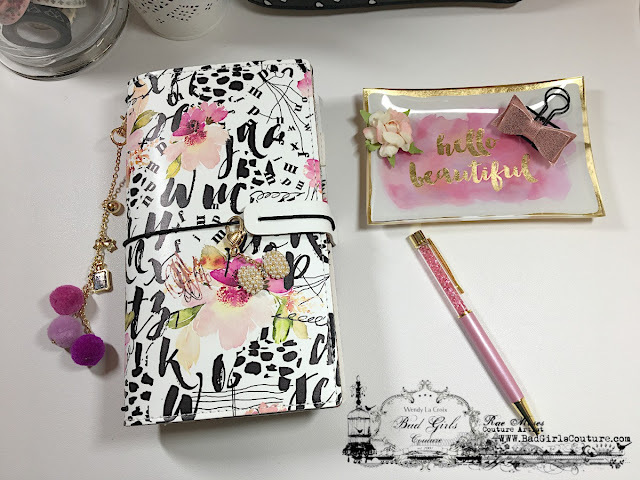 I can't wait to keep adding to this planner and make playing with all of these pretty things a part of my routine. 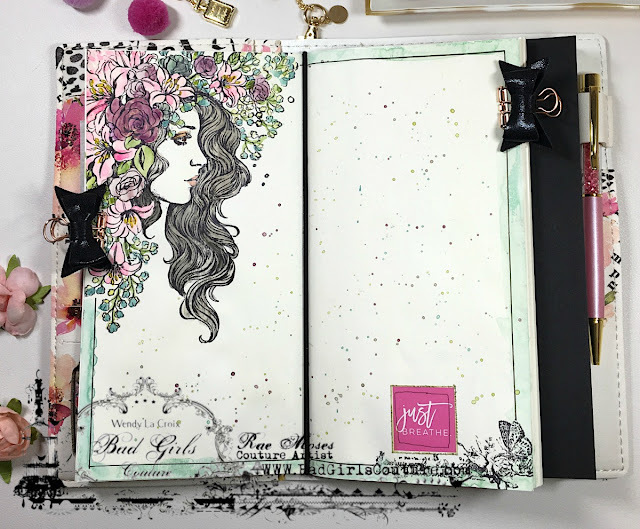 And, if you haven't joined the planner world yet, getting one of the Bad Girls Planners kits would be a great way to start! Check out the shoppes today and see what kits are still available!